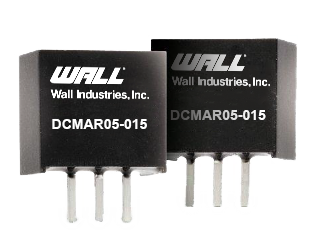 The DCMAR05 series of DC/DC switching regulators offers 0.5A output current in a compact 0.45” x 0.30” x 0.40” standard SIP-3 package. This series consists of fully regulated single output models with high efficiency and low ripple & noise. Each model in this series has short circuit and over temperature protection, no minimum load requirement, and is RoHS & REACH compliant. Please contact factory for order details. Notes: 1. With an input capacitor 22µF/50V for input voltage >28VDC, input voltage allows 32VDC, max. 4. Natural Convection is about 20LFM but is not equal to still air (0LFM). 5. 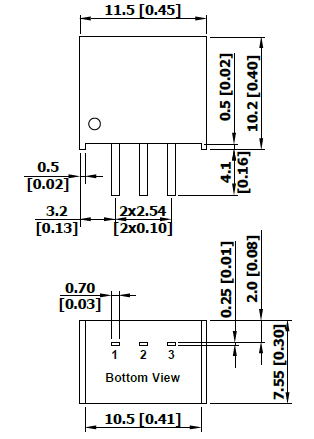 This series can meet EN61000-4-4 by adding a capacitor across the input pins. Suggested capacitor: CHEMI-CON KY 330µF/100V.